Since joining the Communications Design Group almost two years ago, I’ve found it a bit difficult to describe exactly what my job is. And since a few people have asked me lately, I figured it might be worth writing about here. The first problem I always have is explaining CDG itself. It’s not a company, and it’s not exactly part of a company either. The best I can come up with is this: we’re a loosely-organized group of researchers who are interested in technologies for communication, thinking, and learning. The people in the group are employed by various organizations, including SAP and Viewpoints Research Institute. Our main offices are in San Francisco and Los Angeles, but some people (like me) work remotely. If you’re interested, check out the full PDF, which includes links to some projects and demos. My main focus for the past year has been Ohm, which was created by Alex Warth as a follow-up to his cult language OMeta. 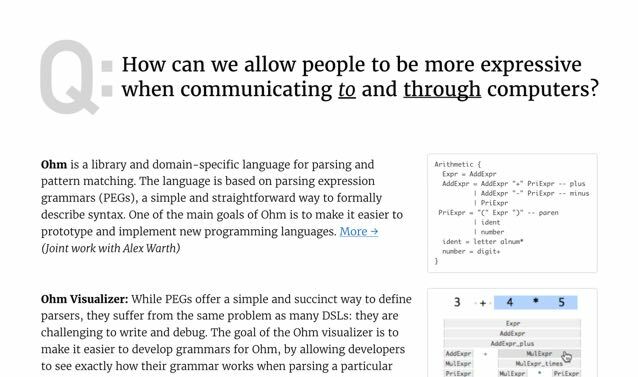 For now, the best place to learn about Ohm is the GitHub project page, but we plan to publish some more complete documentation soon. I consider myself incredibly lucky to be a member of CDG (thanks Alex, Alan, and Kim!). The people I work with are amazingly insightful, creative, and talented. We’ve been relatively quiet up to now, but I hope you’ll be hearing a lot more about our work in the future! Update: CDG is no more! Most of the group has moved on to YC Research HARC.